I have been in fitness my whole life. From growing up doing gymnastics and dance, to group sports, running, cycling, bodybuilding, and triathlons - movement is in my family. I have enjoyed climbing 38 of the 14'ers in Colorado over the last 15 years with my husband. I started teaching group fitness and then went into personal training, which I have been doing for the last 20 years. I enjoy sharing my love for healthy lifestyles and physical well-being with people, and bringing the athlete out in everyone. I believe that with a positive attitude and an uplifting energy toward life, good things will come your way. This came true for me when I found Da Vinci BodyBoard. As soon as I stepped onto the BodyBoard I could not get enough of it. I knew it would be a perfect fit for Fort Collins. Fitness has changed my life in so many ways. It has helped to make me feel more confident and give me passion in life. My desire is to be able to share this passion with others and help people feel confident in their own skin. I have been a dancer since the age of three. I started studio dancing at a young age and kept at it until age 18. I joined the Varsity pom squad for the last two years of High School and I taught Zumba fitness for five years. I am currently a member of the National Physique committee and have been Bodybuilding for three years. I am a national bikini competitor and absolutely love training in the gym. I am CPR and First Aide Certified and also hold an ACE Personal Training certificate. I am so excited that I am now certified on the Da Vinci Body Board. It is such a unique and fun workout that incorporates the entire body, and I truly believe it is an incredible and achievable way to get that healthy, happy body inside and out! I was born and raised in Santa Fe, New Mexico. I graduated from St. Michael’s High School in 2011. My passion has always been in over all beauty wellness and outdoor fitness. I love mountain biking, hiking, wake boarding, paddle boarding, weight lifting, yoga, and snowboarding. I graduated from Vogue Beauty School in 2013 with a cosmetology license and have been working in the beauty business since then. In October of 2016, my husband left on his final deployment and I moved home to Santa Fe. This is where I found the BodyBoard. As I have always loved beauty and fitness, I have now found a way to incorporate both of these passions into my life with Da Vinci BodyBoard. 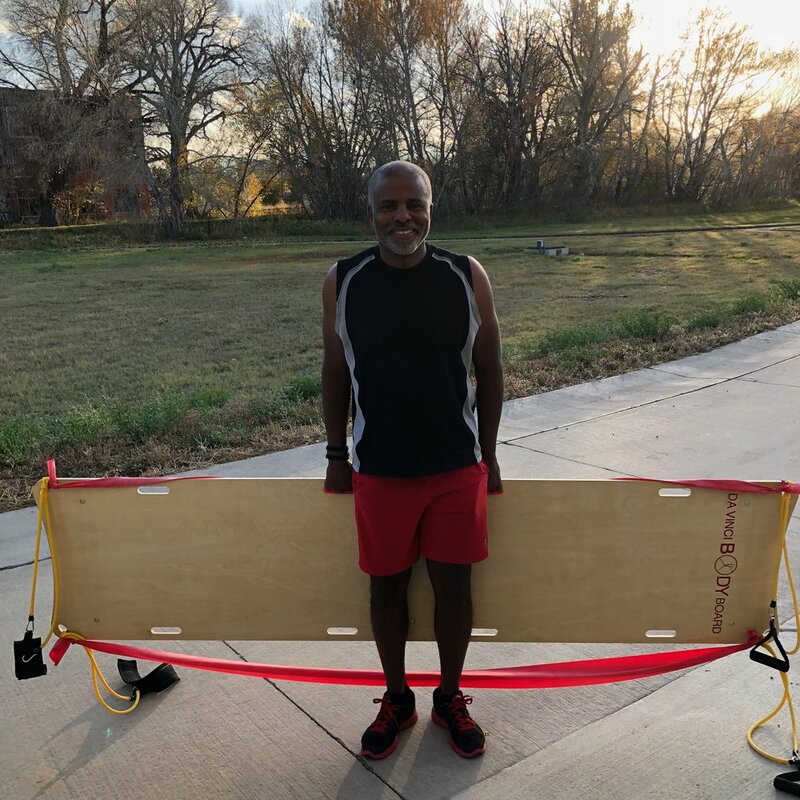 I have been involved with the Flagship studio in Santa Fe, New Mexico and have been trained and certified by the owner and creator of Da Vinci BodyBoard, Florey Mahoney. I was so blessed to meet Theresa Rudel, owner of the FOCO Da Vinci Body Studio and become part of her team. I am so excited to start this new journey with all of you. You’re all gonna love it!! Greg has been teaching fitness a longggg time. He started in the fitness world by instructing high impact aerobics (yes, during the days of tights and leg warmers). He then moved to step aerobics and currently teaches Cycling and Core classes. He's a 30 year plus Colorado native and his hobbies include road cycling, yoga, golf and a wine sommelier wanna-be (not necessarily in that order). Greg's 8 to 5 job is working as an Human Resource Manager. He's excited to teach Da Vinci because "it provides me with a different and new fitness routine in a relatively short amount of time." At the start of my fitness journey, I gravitated towards running regularly and competing in races ranging from 5K's to 50K’s. I regularly cross train on a road bike, incorporate functional training and yoga. Being a spouse of twenty plus years, mom of three children, a volunteer with SAVA (Sexual Assault Victims Advocacy), National Charity League, CPR/AED certified and now instructing on the Da Vinci BodyBoard; fitness is as present and enjoyable in my life as it was at the start. Jill has been into fitness for as long as she can remember. Finding her passion for teaching yoga over 10 years ago, she has been teaching ever since. She holds her 500 hour teacher training certification through yoga alliance with her advanced education in the anatomy. Jill feels very comfortable working with all ages, shapes and sizes, as we are all unique. When Jill first tried a Da Vinci BodyBoard class, she was hooked and had to pursue her certification in it. It's so much fun and with so many options, you will never get tired of it! It's motivating, energizing and so efficient, you'll be hooked too! Jill's hobbies include, skiing, hiking, playing with her dog and of course, yoga. Adding this, makes everything that much better! We need to keep motivated and keep moving all throughout life. No matter what your fitness level, DVBB classes will challenge you and I dare you not to have a blast! Shannon is a runner, yogi, winter sports lover, and fitness enthusiast who possesses a creative fascination of the human form and the fluidity of its movement. Her passion has developed into the integration and understanding of the next level of mind, and body. Shannon has worked in the fitness industry for over 25 years. During this time, she also worked for an athletic event timing company for 15 years, which enabled her to develop an appreciation for the dedication and inspiration that athletes bring to their training and racing. Along the course of this journey of health and fitness she received her personal training certificate and massage therapy certificate in 1999. Shannon’s 10 years as a massage therapist have given her unique insight to muscular structure and the body in general as a cohesive harmonic form. Shannon lives in Fort Collins with her super cool husband, daughter, and hound dog. I have been a sports and fitness enthusiast my entire life. Growing up I played a multitude of sports through high school (all-state in basketball and track) I eventually settled on track/cross country where I then competed for Colorado State University. I had a successful career where I was a four time All-Mountain west, two-time All-Regional, Mountain West Champion and NCAA participant. I am certified in Yoga, Yoga Sculpt, and Da Vinci BodyBoard. I have a passion for holistic health and natural remedies to cure the body. Nutrition and balance have become the founding principles in my every day life, and I strive to help others reach them too.